We have some exciting news for you. For a weekend next month, we will be hosting a handmade and vintage fair in the outdoor area of our shopping village. And you’re invited! This will be the first event of its kind that will have been held at Heart of the Shires and we cannot wait for it to get underway and see what you all think. It will take place on Saturday 8th and Sunday 9th October from 10am-5pm and will be free for all to attend. 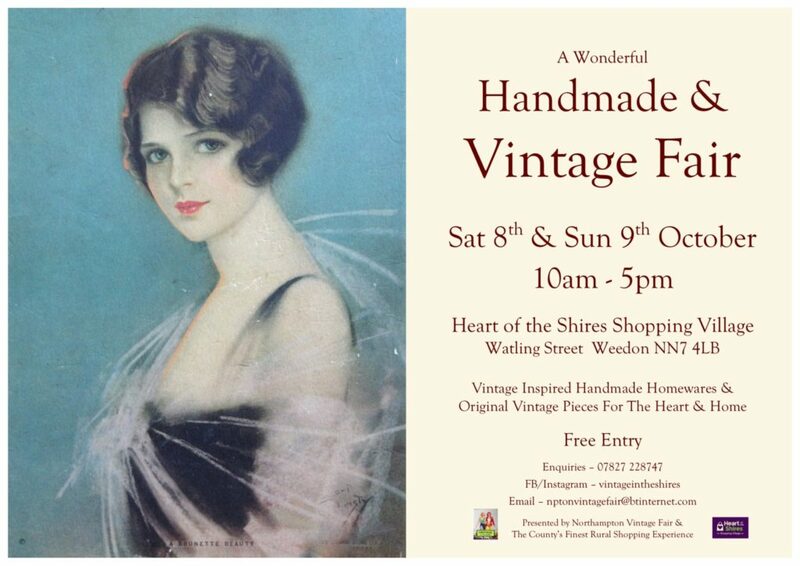 Vintage in the Shires have organised the event. They run fairs and jumbles in Northamptonshire, Leicestershire and other areas of the UK including Scotland. Our fair will focus on vintage handmade homewares and original vintage pieces for the home from the 1930s through to the early 1960s. All of our independent stores will be open, as usual, on the vintage fair weekend so there’ll be extra shopping available to fill your needs. Our shops cover a range of specialities: art, furniture, clothing, health and beauty and more, so we’ll be mixing the vintage with the new! To keep on top of all the fantastic events that we host, sign up to our email newsletter or follow us on Facebook and Twitter. If you’re trying to find us, here is a map and directions.